The “2018 Abu Dhabi Grand Slam Los Angeles” championship was started in LA on 22 September 2018. The participants of the Ukrainian SC “Borets”/ ZR Team Ukraine were also among the competitors. Young fighter of the SC “Borets”/ ZR Team Ukraine Serhii Krasovskyi faced with one of the best junior BJJ fighters, the IBJJF world champion of Brazil and Europe Eduardo Lima. According to the results, young Ukrainian juvenile lost with the score 0:2. 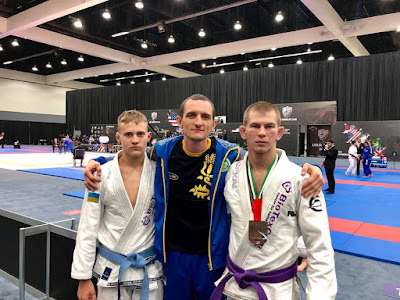 At the end of the championship, the senior member of the ZR Team Ukraine Yaroslav Blazhko won bronze of the “2018 Abu Dhabi Grand Slam Los Angeles”. According to the head coach of the club Ievgen Skyda, the championship had a highly competitive atmosphere. Despite the results, Ievgen is pleased with the performance of his fighters. Thus they gained invaluable experience during the fight with top athletes.